The NKJV Large Print Ultrathin Reference Bible includes numerous reading and study helps. 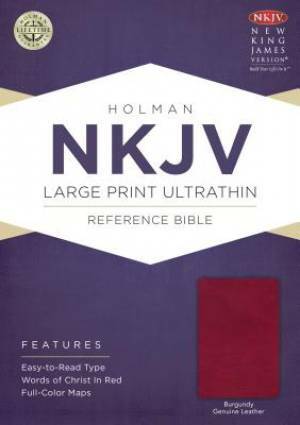 NKJV Large Print Ultrathin Reference Bible, Burgundy Genuine by Holman Bible Staff, was published by Holman Bible Publishers in July 2014 and is our 68231st best seller. The ISBN for NKJV Large Print Ultrathin Reference Bible, Burgundy Genuine is 9781433606830. Be the first to review NKJV Large Print Ultrathin Reference Bible, Burgundy Genuine! Got a question? No problem! Just click here to ask us about NKJV Large Print Ultrathin Reference Bible, Burgundy Genuine.